I'm a full-stack Web and Software Developer, currently living in Nairobi. I am constantly experimenting with new technologies. I love it. I offer affordable and cheap web design, web development and software development services in Nairobi, Kenya. Get in touch for deals. I also love writing short articles and sharing them here. I find myself here a little more than several times ... When stuff just doesn't work. The saviour part is when all is working in the test environment. It all then fails when the client steps in and asks for the final packaged product...Whatever the hell happens during packaging in what has the potential to keep you awake through the night. 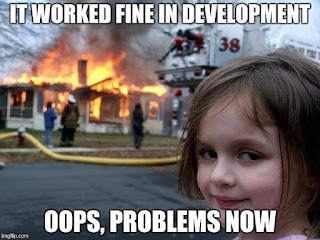 May be the deployment environment has different settings, may be version issues, may be rights and /or permissions....just anything. May be you forgot to copy some files..anything here is of importance taking note of. I used to be a victim till I decided to be replicating close to if not what the client has. In development, I try as much as possible to use the technology supporting the final product. If its unix based, develop in unix based systems, if windows, same. Just be close to the final environment, if you can't be there. The Hyper Text Transfer Protocol (HTTP) was initiated at the CERN in Geneve (Switzerland), where it emerged (together with the HTML presentation language) from the need to exchange scientific information on a computer network in a simple manner. The first public HTTP implementation only allowed for plain text information, and almost instantaneously became a replacement of the GOPHER service. One of the first text-based browsers was LYNX which still exists today; a graphical HTTP client appeared very quickly with the name NCSA Mosaic. Mosaic was a popular browser back in 1994. Soon the need for a more rich multimedia experience was born, and the markup language provided support for a growing multitude of media types. Make your website noticeably faster. Allow you to debug your server with ease. Make your life easier and more rewarding. Allow you to work faster and more productively. - The Lord wants to step into your situation and show His strength. - The Lord wants to show Himself strong on your behalf. - Our hearts are perfect towards Him when we have placed all our hope in Him. - No situation escapes His view, so let's be confident in His strength and ability. PRAYER: Lord, I pray that You will come and show Yourself strong on my behalf. Move in my situation and may I see the powerful and mighty hand of God at work. Amen. Awesome day. Been happy, save for having a simple repetitive task. This means, I had time to find out why bro ocholla was [not] praying today. A photo is worth a thousand words, so here you go. I love this tune..Wow.. Phil made this HIT!! You want us to be friends? Well....start by liking this song!!.. Eulogy | How could you leave us? Can't use a past tense..I love my dad. I told my dad I loved him once, and it felt awesome. Had never done. I've never told my mum that I love her. I think I need to. I felt so bad...I've never wanted the news bearer to be as wrong as that day. I thought of praying and raising the dead, but just couldn't do it. Science said no, God let it happen. He has reasons. Can't question. NF kinda painted it for me. Honestly, some things can't be forgotten. Can't be undone. Can't be replaced. The only thing I have are precious last moments and advices. Specifically the last thing I did is share a cup of tea in my room. If you're watching Dad, I'm not looking back. I'm matching forth daily.